Nathalia Vera, 6, climbs back over the fence after petting and running around with the pet. The goat began to jump and stomp at the kids, so she decided she needed to get out of his home. Adolfo Vera crawls under the cement floor to work on a drain in one of the newest barns as his wife Ana Vera chats with him from above. Adolfo is determined to start up the abandoned dairy farm that hasn't been in operation since 2009. A gray overcast hangs over a variety of farm and random pieces of equipment on the soon to be Vera farm. Painting the windowsill white, Ana Vera talks with her oldest son, Adolfo Jr., 7, as he looks for something to do. The family go back and forth between speaking Spanish and English. The children learn English at school, but for the most part speak Spanish at home in order to hold onto a part of their culture. Removing an old wire but saving the brackets, Adolfo Vera consistently works to improve the farm. He does most of the physical labor on his own but will call in for help as a last resort, only if he comes across a task he is unfamiliar with. Taking turns with her siblings falling back into the tall weeds, Nathalia Vera, 6, is constantly playing around, always having fun. 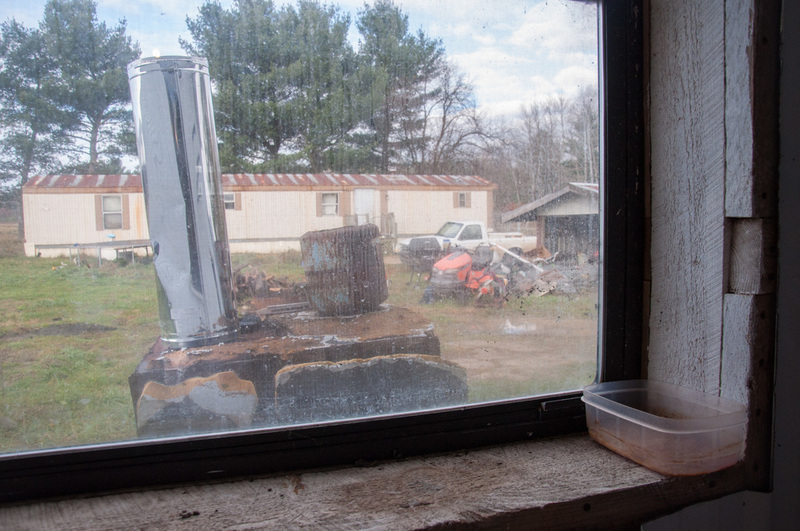 A peek through a window shows an old piece of machinery as well as the Vera family’s soon to be home in a few months on October 30, 2015. As Ana Vera holds her youngest son Gerardo, 6 months-old, in her arms, Adolfo Vera adores him after working in the barn all day. After looking over the seals on the pipe, Adolfo Vera replaces the old pipes with new ones that will be used to transport the fresh milk. From left, Adolfo Vera Jr. 7, and his sisters Nathalia, 6, and Florencia, 3, take a breather from all the jumping as they play together on the trampoline. An early morning sunrise in Barryton, Mich. begins to shine on the growing Vera dairy farm. While traveling from Mexico to Michigan, Adolfo Vera had his mind set on his own American dream. Vera left Mexico mainly for work, but also because he truly does not like the quality of life in his home country. According to Vera, when police pull people over in Mexico, they talk the driver into paying them to avoid getting in trouble with the law. Most of his family stayed behind in Mexico, taking care of their own farm, selling some cows for beef as well as milking others. However, Adolfo moved on to Michigan and later decided to visit family in California. He met his future wife Ana through a family friend of theirs, and it was love at first sight. She came back to Michigan with him and shortly after they got married, they started a family. Adolfo and Ava have four children - Adolfo Jr., 7, Nathalia, 6, Florencia, 3, and Gerardo, 6 months. 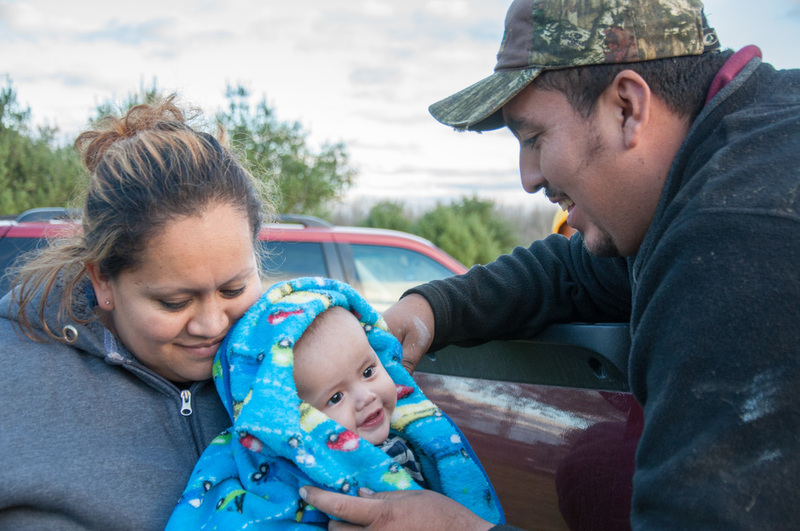 They decided to try life in Ohio for a bit, with Adolfo still working on dairy farms, and in the end decided Michigan is where they wanted to raise their family. Adolfo got tired of working under people and had issues with his bosses, so as a couple they decided they wanted to start a dairy farm of their own in Barryton, Michigan. Currently, they are renovating a dairy farm that has been out of commission since 2009. They have been working on this farm since August 2015 and already have high hopes of bringing in cows by December 2015. There are endless amounts of work to do, but Adolfo and Ana are more than prepared to take on this challenge. In addition to working on the farm, Ana works part time as a school bus driver, and Adolfo is on call for multiple dairy farms around the area to help out for extra money. Not only do they want this farm to be a success for financial reasons, but also to have some solidity for their children's futures here in America. Bio: Kaytie Boomer is currently a senior photojournalism major at Central Michigan University and works for CM-Life, the newspaper at the university. Kaytie has known since her sophomore year in high school that she wanted to tell stories of unheard people through her photographs. She has been working to improve her skills for four years and hopes to continue telling meaningful stories of people in the future. Experience: I have never felt more supported by a group of people before, and I could not be more lucky to be in this field. This workshop pushed each and every one of us out of our comfort zones to tell stories that truly deserve to be heard. At first, I really struggled with finding a subject for the workshop. But luckily, through a friend within the workshop, I was led to Adolfo Vera and his amazing family. Overall, my experience with them was unbelievable because their story is so unique, especially when it’s compared to the many American views that immigrants, “steal our jobs.” They are not stealing anything. They are just starting back up a farm that was shut down. In reality, they are helping the community bring in more dairy in the area. I enjoyed their company so much and learned an immense amount about dairy farms that I had never known before. It was a fantastic learning experience, and I hope to continue the story.